SketchUp 2016 was released a few weeks ago, with a few new features and under the hood improvements. You can find the full list of features (and download the latest version of SketchUp) at this link. 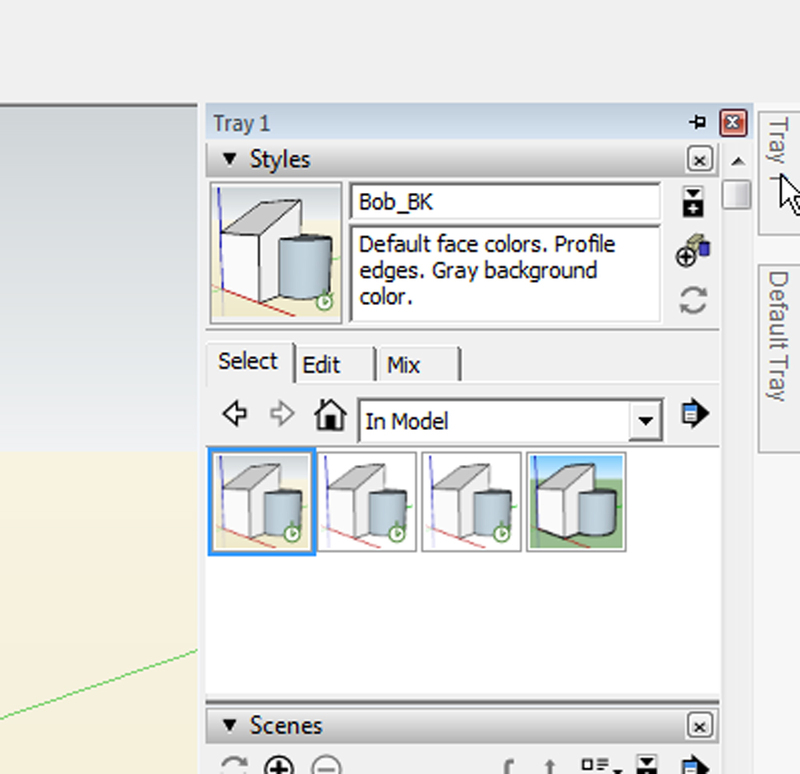 If you use SketchUp on a Windows machine, you can now park all the program windows in a specific area, called a tray. 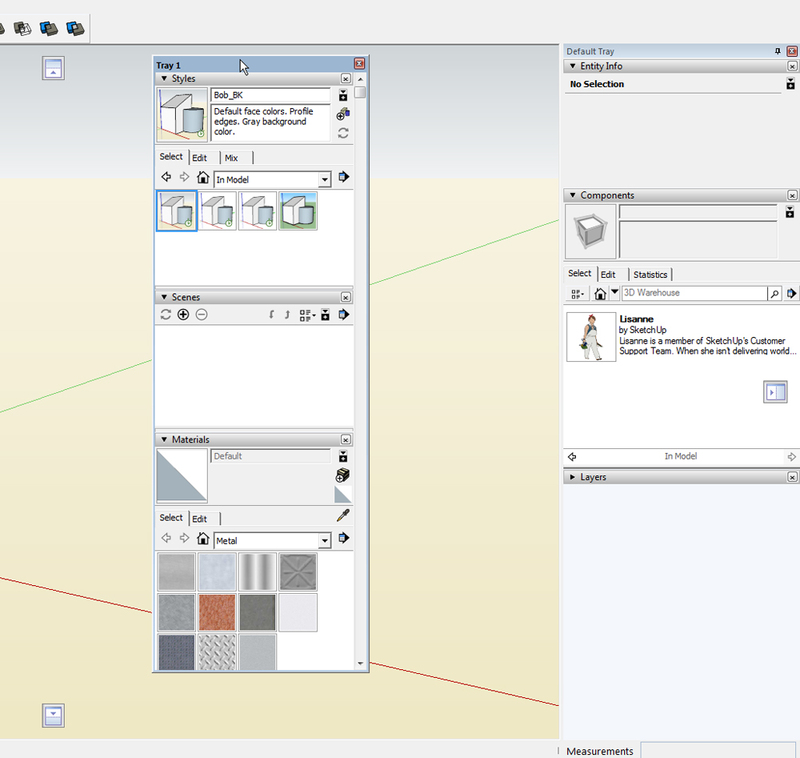 Many of the really cool features of SketchUp have their own window. In the past these little windows were available through the WIndow menu. The program windows could be expanded or collapsed by clicking on the title bar, and you could stick them to each other and park them on the side of the screen (or wherever you liked). The trouble was it is easy to click the red X and close the window when you mean to collapse it, and they didn’t always play nice with each other; instead of docking to a neighboring window they could hide behind it. Now when you click on the Window menu, the first two items are “Default Tray” and “Tray 1”. 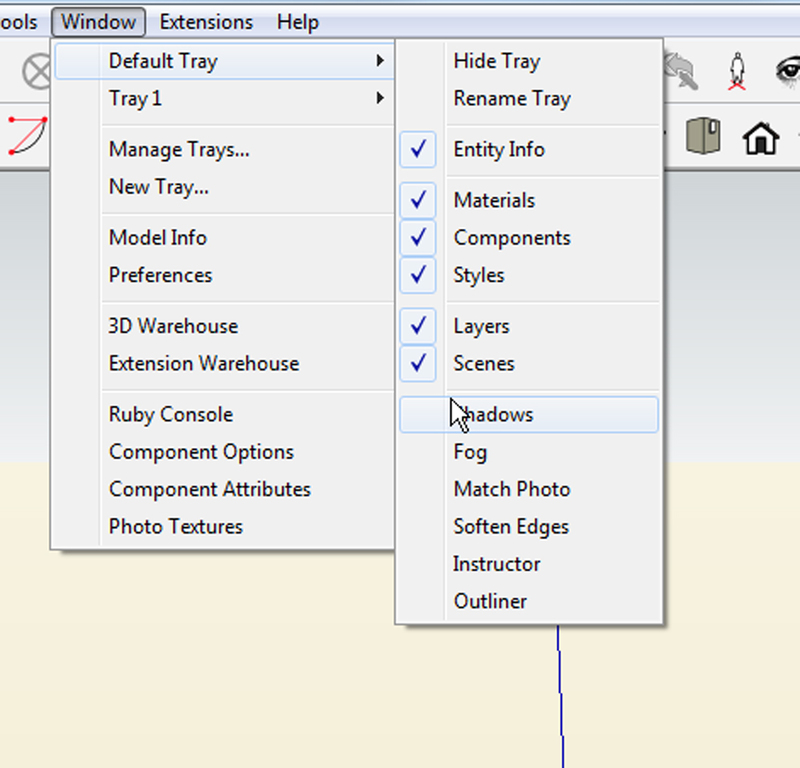 Click on either of those and the menu seen in the photo above appears, the list of available windows in SketchUp. Check to the left of the name to make that window appear in the tray. The windows will be added to the tray in the order that you click on them. You can’t drag them by the title bar and park them independently any more, but they still expand and collapse with a click on the title bar. 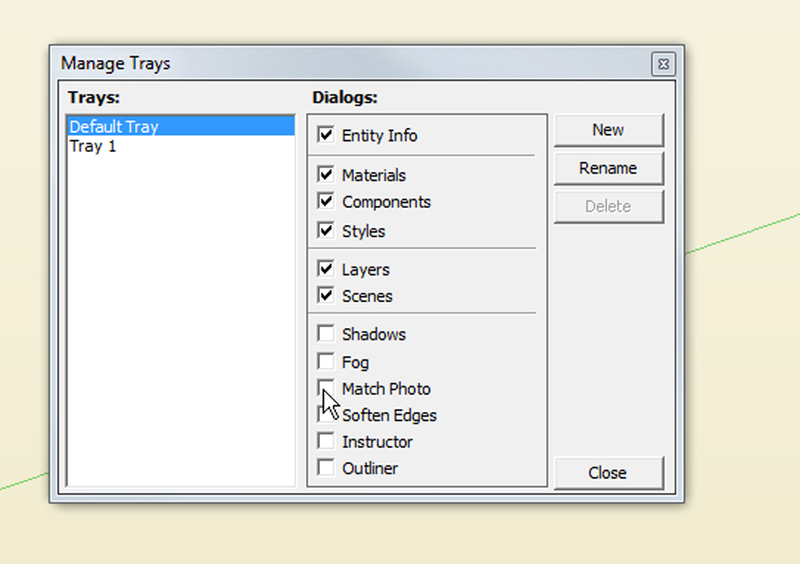 Setting up a tray is easier if you skip on down the Window menu and select “Manage Trays”. That opens up the pop-up window seen at right, with the same options. You can have more than one tray, so you can have a group of windows you use most often in modeling in one tray, and a group of rendering windows in the other. You can create additional trays, or rename the existing ones through this window as well. When you assign a window to a tray, it removes it from any other tray. It will probably take you a few tries to get things organized and in the order your prefer. In the modeling window, you can drag the entire tray around, and when you get close to the center or edge of your screen little icons appear that point to the edges of the screen. Click on one of those icons and the tray docks on that edge. If you have more than one tray, you can park one on the right side of the screen and the other on the left, the top or the bottom. Within the tray, you can adjust the height of each window, and you can expand or collapse them by clicking in the title bar to the right of the name. With the addition of trays (once the tray is set up) the windows will always be where you left them. This ought to be helpful to those learning SketchUp, “where the heck did my Components window go?” is something I hear a lot in my classes. I’m still getting used to trays (and still fooling around to get the ideal tray setup for the way I work), but the best part is the trays have an “auto-hide” feature. There is a tiny push-pin icon just to the left of the red X in the tray’s title bar. That icon toggles “auto-hide” on and off. When “auto-hide” is on, the trays collapse to where they were docked, leaving a tab with the trays name. When your mouse cursor is over the tab, the tray expands and stays open as long as the cursor is within the bounds of the tray. When the cursor re-enters the modeling space the tray collapses. If you are working on a lap-top, or are otherwise challenged for screen space, auto-hide gives you quick access to the windows while leaving you plenty of room to model. A lot of people say that SketchUp is intuitive and easy to learn, but not everyone catches on right away. If you’ve been struggling, I can help with my SketchUp Interactive PDF books, or SketchUp classes. My next SketchUp class in January 30 & 31, 2016 in Denver, Colorado. CLICK HERE FOR DETAILS AND SIGN UP WHILE SPACE IS STILL AVAILABLE.